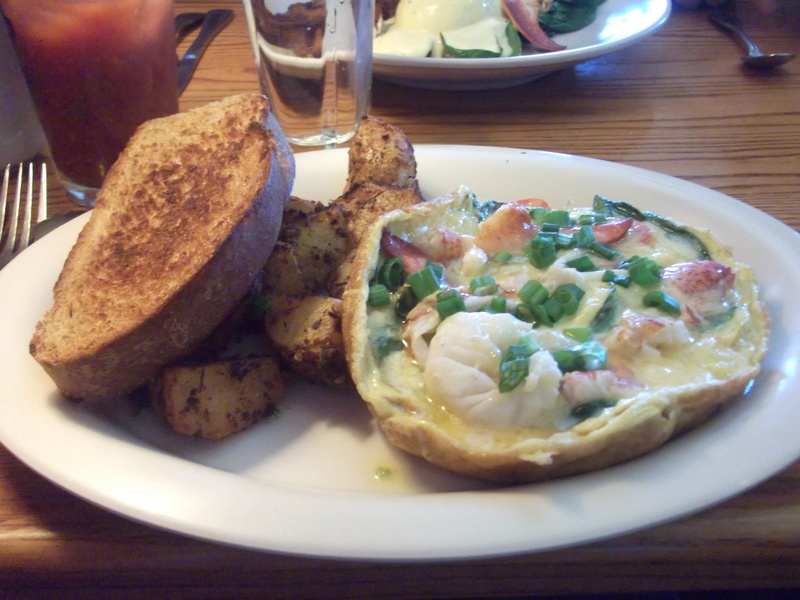 Thanks to another great Living Social deal, Mark and I headed out to Corner Room for some brunch fare. I must admit my ignorance, as I didn’t even know they had brunch. I thought maybe it was a limited time thing, but I checked out the fine print and then Googled the menu and saw that indeed this was a legitimate affair. It’s something new that they are offering. 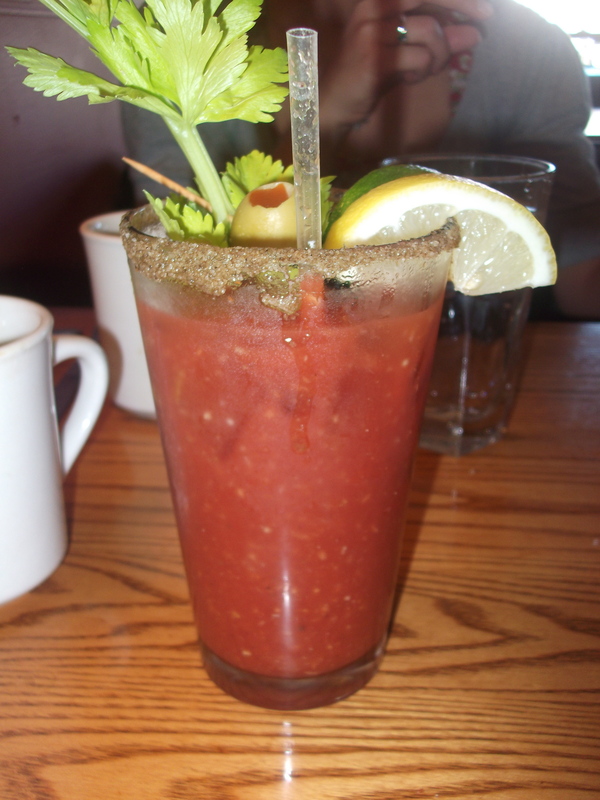 We strolled in early by brunch standards, 10:30 that morning, and were asked if we had reservations. Umm, no?! I wasn’t aware that most places even took reservations for brunch, so either I am going to the wrong places, or this was just a little unorthodox. The managed to “squeeze” us in, which was seemed odd, because only three other tables were occupied. We sat down and quickly ordered coffee and I ordered a Blood Orange Mimosa, while Mark went for their signature cocktail, the Corner Room Corpse Revivor. The drinks were great, though mine wasn’t especially blood orange flavored. Mark’s was gin with conglomeration of bitters and other liquors with blood orange juice. I must admit, I couldn’t have cared less about it since it was made with gin. I hate gin. Mark on the other hand, thought it was wonderful. He had it made with Cold River Gin, made just up the road in Freeport, Maine. Since we had a $50 coupon, we decided to splurge a bit and try a few different menu items. The Sweet Ricotta and Nutella Crespelle really spoke to me, because I love crepes and I adore hazelnut flavored ANYTHING. The tiny hint of orange combined with the hazelnuts on top of the crepes really added to the dish. One of them looked a little burnt on the outside, but it tasted great, so it was more aesthetic than anything. It was not the best crepe I have had, but it was pretty darn good and we really enjoyed it overall. I kind of wish we have opted for it as a sort of “dessert” after our meal though. 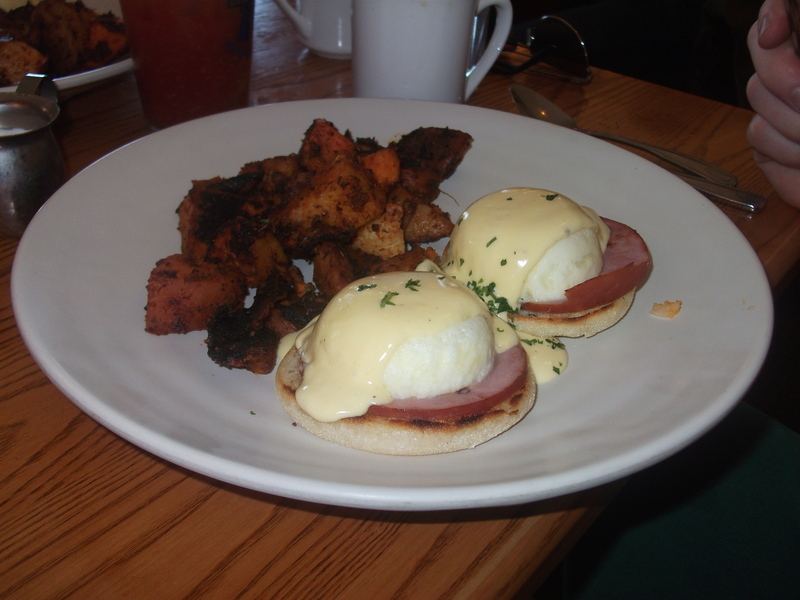 For our main brunch item Mark ordered the Eggs Benedict. I swear this man is obsessed. He gets it pretty much everywhere we go, and on every occasion he deems Bintliff’s to have his most preferential version. This was no exception. He really didn’t like the olive oil hollandaise, and I can’t say I disagree with him. You could really taste the olive oil, and if there is anyone that you could feed olive oil to without complaints, it’s us! We use olive oil in everything—including baking, but this was an exception. It just really didn’t work with this dish. I decided to go with the rather heavy Norcino Colazione, or butchers breakfast. In Italy a norcino was a butcher who went from house to house making sausages for pig farmers. I thought the name was very clever, but this dish reminded me more of an English breakfast than an Italian one. 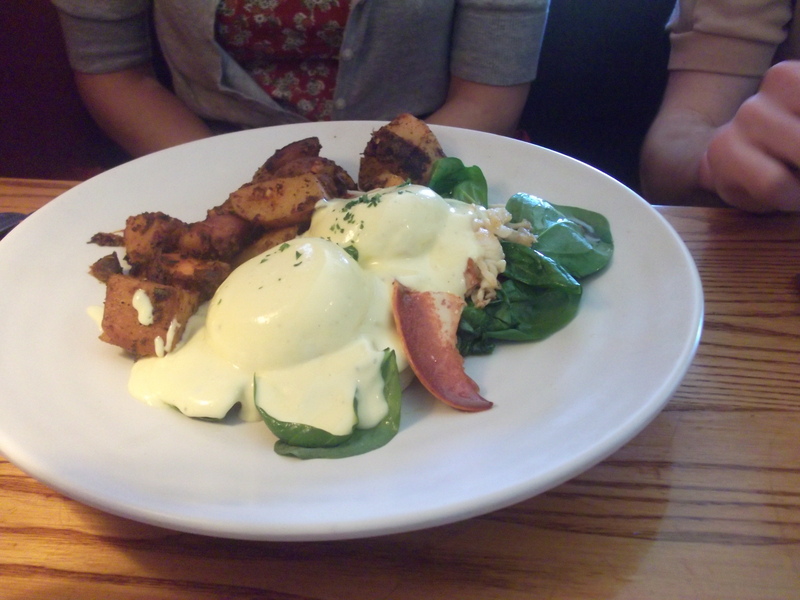 It came with two eggs fried in pork fat, black pudding, beans, bacon rashers, and toast. I would like to say, this was my first experience with black pudding. For those of you who don’t know, black pudding (or blood pudding as some call it) is a type of sausage that is made from congealed blood. I absolutely love blood sausage (much to the chagrin of many people I know). I swear, I really wish more people would try it as there is no “iron” or “blood” taste to it at all. It might sound a little odd at first, but it’s been popular in countries like Germany, England and Italy for centuries. The black pudding at the Corner Room was pretty darn good. I even got Mark to try it and he gave it his seal of approval. There were some nice chunks of beautiful white fat dispersed throughout the loaf. It had a nice saltiness and texture to it. I would definitely eat here again just to have it. I don’t know of anywhere else in town that I can get black pudding for brunch. The beans on the side were cannelloni, and they were definitely undercooked. I am not sure if they were supposed to be English style or what. I was more confused by them than anything. The eggs were amazing and cooked to a delicate over-easy. Paired with the thick slabs of extremely meaty bacon they were salty and delicious. No seasoning needed whatsoever. They were also beautiful and you could tell they were farm raised from the colorful orangish-yellow yoke. Delicious. I would recommend making a reservation before you go, it will be worth your while to avoid a wait. If you are an adventurous eater, don’t forget to order the black pudding. While the Corner Room didn’t have an overwhelming ‘wow’ factor for brunch (I prefer their dinner much more), I really liked some of the items we had. The theme just seemed a little lost, if you have an Italian inspired restaurant one would think the brunch would be more Italian inspired… but I digress. While I will probably eat here in again in the future there are many other brunch spots I would rather try before coming here again.